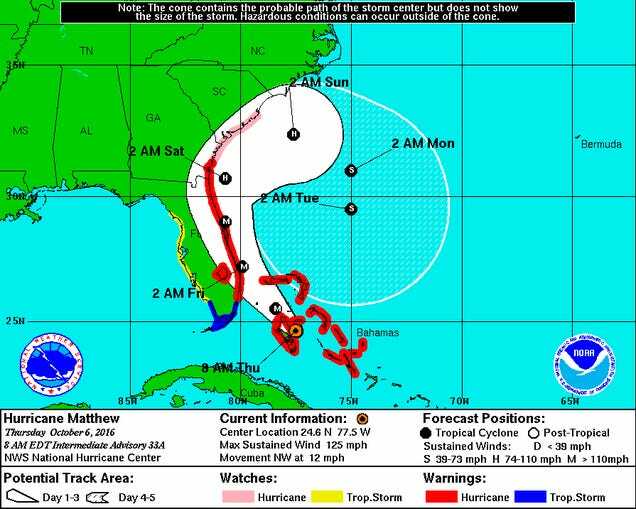 All signs are pointing toward deadly hurricane Matthew slamming directly into Space Coast—home to Kennedy Space Center and Cape Canaveral Air Force Station—on Friday. If that unfortunate prediction comes true, it’ll be the worst storm to hit the iconic Florida spaceport since it was built in 1962. Weaker and more distant storms have dealt Kennedy considerable damage in the past. A direct hit by a Category 3 or 4 monster is a nightmare scenario for NASA’s crown-jewel, $11 billion spaceport. The space agency has always known that such a storm was possible at Kennedy, whose two launchpads rise like giant concrete lilies from a swampy barrier island with nothing but a thin, rapidly eroding stretch of beach to protect them from the sea. The center was built this way for a very good reason, to avoid rocket explosions over populated areas. But in the age of human-caused climate change, Kennedy’s exposure to the ocean has become its Achilles heel. In the Atlantic, the frequency powerful hurricanes and large surge events has been rising in step with rising temperatures, which provide more energy to grow and sustain monster storms. And Space Coast has been feeling the consequences. As sources at Kennedy told me during a recent visit, coastal damage from hurricanes has been a major problem since at least the early 2000s. Hurricane Sandy flattened protective dunes between Launchpads 39A and 39B, resulting in millions of dollars of shoreline reparations. Photo: NASA. When Category 2 Hurricane Frances made landfall roughly 100 miles south of Kennedy in 2004, tropical storm-force winds lashed Space Coast, ripping more than a thousand panels off the Vehicle Assembly Building and resulting in 100 million worth of damage. When enormous Hurricane Sandy passed 200 miles offshore in 2012, an 100-foot chunk of beach between launchpads 39A and 39B was devoured by the ocean, resulting in millions of dollars of shoreline reparations. Vehicle Assembly Building in 2004, after Hurricane-force winds ripped off a significant chunk of outer paneling. Image: Wikimedia. Here’s the thing about Matthew: Space Coast has never dealt with anything like it. Not in launch history; not in meteorological records dating back to 1851. 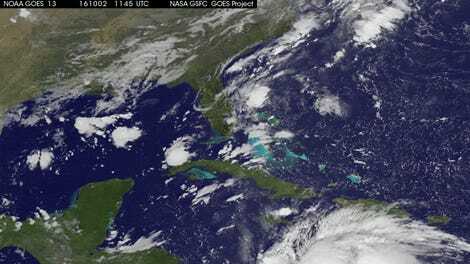 The storm is projected to pass perilously close to Florida’s entire eastern seaboard beginning later today, with a Category 3 or 4 eye passing directly over Kennedy Space Center on Friday, according to Weather Underground meteorologist Jeff Masters. Kennedy’s Orbiter Processing Facilities are rated to withstand sustained winds of 105 mph. The Vehicle Assembly Building and launchpads hold together up until about 115 mph, while newer buildings constructed after Hurricane Andrew in 1992 are designed to weather 130 mph winds. If the storm does hit at high tide, the NHC warns of surges as high as 9 feet from central Florida all the way up into southern Georgia. Most of Kennedy’s infrastructure sits between five and ten feet above sea level. 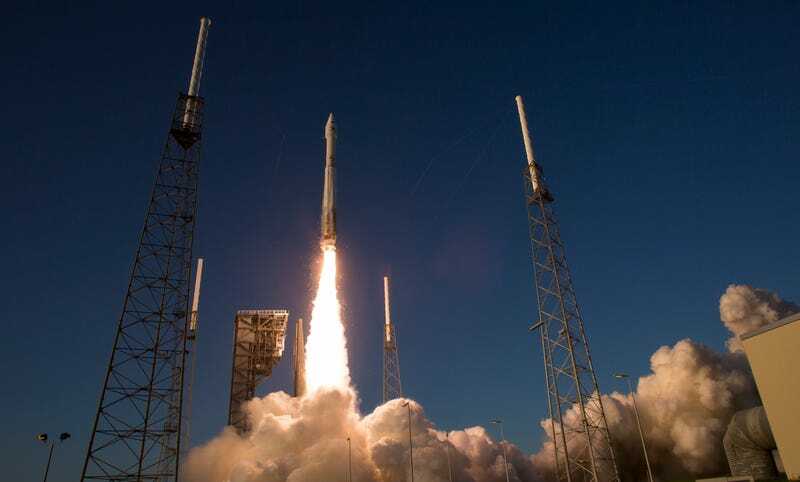 Yesterday, Cape Canaveral Air Force Station entered “HURCON II” condition, releasing all non mission-essential personnel and suspending operations. A mandatory evacuation for all “personnel and residents on barrier islands, in manufactured homes and in slosh zones” began at 3pm ET. Space Coast is being left to the elements. The only question is what will remain when the storm’s through with it. Hurricane Matthew has now passed offshore from Cape Canaveral and is north of Kennedy Space Center. The wind is starting to decline but remains near tropical storm strength. However, until the wind is consistently below 50 knots a crew cannot be sent outside to begin a more thorough look at KSC. That is expected sometime this afternoon. At this time there is observed to be limited roof damage to KSC facilities, water and electrical utilities services have been disrupted and there is scattered debris. Storm surge has been observed to be relatively minimal, limited to localized portions of the space center. The Damage Assessment and Recovery Team will be brought in for its formal assessment Saturday morning. Whew! We’ll check back in later in the day after the storm has passed and the damage has been more carefully assessed, but it looks like Kennedy dodged a bullet.